Objective: In India, the proportions of overweight and obese people now co-exist with those who are undernourished. The current study attempted to estimate the prevalence of overweight/obesity among adolescent girls in Salem District, India. Materials and Methods: The study was carried out at the Salem block in Salem District from November 2012 to March 2013. Totally 6619 school going adolescents had been included, their anthropometric measures include height (cm), weight (kg), waist (cm) and hip circumference were measured. Body mass index (BMI) and waist-hip ratio (WHR) were calculated. Overweight and obese adolescents were identified based on their BMI. For comparison, girls with normal weight were selected by simple random sampling technique. All the selected girls were in the age group of 10-15 years, and they studied from 6 th to 10 th standard. Results: The overall rate of prevalence of overweight/obese among adolescent girls was found to be 454 (6.86%). The highest prevalence was observed at the age of 10-11 years (7.82). Mean anthropometric measures of overweight/obese adolescents were higher than normal girls. Mean anthropometric measures of normal and overweight/obese girls were significantly increased by age groups except hip circumference. BMI was highly influenced by weight followed by age, height, hip circumference and WHR of the overweight/obese girls. Conclusion: Prevalence of overweight and obesity was increasing in developing countries, among school going adolescent girls; weight and age were the major influencing factors of overweight/obesity compared with other anthropometric measures. Obesity is a chronic condition characterized by an excess of body fat,  it represents the most frequent public health problem globally. Overweight is defined as a body weight that exceeds the acceptable weight for a particular person, based on the individual's age, height and/or frame size. Furthermore in both developed and developing countries girls are proportionately more overweight than boys. , World Health Organization (WHO) recommends anthropometry as the single most portable, universally applicable, inexpensive and noninvasive technique for assessing the size, proportions and composition of the human body. Anthropometry reflects both health and nutritional status and predicts performance, health and survival. Body mass index (BMI) has been conventionally used to define and classify overweight and obesity. During adolescence, BMI is the preferred method of expressing body fat percentile of groups. It is widely accepted that a BMI between 85 th and 95 th percentiles is defined as overweight, and a BMI greater than the 95 th percentile as obesity. ,, Statistics also shows that the prevalence of overweight continues to increase during the school age and adolescent stages. The prevalence of overweight and obesity was significantly higher among girls than boys (P < 0.0001) and this was markedly seen in adolescence. The prevalence of overweight and obesity among affluent girls aged 10-15 years in Chennai was 9.6% and 6.2% respectively in 1998. The highest prevalence of overweight among girls is found consistent with the gender difference in other Indian populations and other parts of the world. ,,,, The prevalence of adolescent overweight was in the age group of 13-17 years, higher among girls (9.1%; 95% confidence interval [CI]: 7.4, 10.8) than among boys (6.9%; 95% CI: 5.8, 8.0) in Guntur District, Andhra Pradesh, India. The prevalence of obesity among children aged 6-11 years increased from 6.5% in 1980 to 19.6% in 2008. The objective of this study was to find out prevalence of overweight/obesity among school going adolescent girls in Salem District, India. The present study was carried out at Salem block in Salem District. As details given by the Salem District Educational Officer, totally 23 girl's higher secondary schools were located in Salem Block; about five schools were randomly selected and included in this study. Cross-sectional data were collected from November 2012 to March 2013. Totally 6619 school going adolescents who were studying 6-10 th standard in the age group of 10-15 years were included and comprised of two groups of adolescent girls, one group were overweight/obese girls (No-454) and another group of girls representing normal (No-454) population as they were selected by simple random sampling technique. Body mass index centile curves,  waist circumference centiles,  and waist to height ratio  are some of the accepted standard measures to determine obesity among children. Height is considered to reflect the intake of nutrients over a considerable period. Height was measured to the nearest 0.1 cm by a portable stadiometer. The recorded values were compared with the standard (ICMR, 2010) of the respective age. Height was measured in standing the position next to a wall with heels, hips, shoulders and head tangent to the wall. Body weight was measured by an electronic weighing balance with 0.1 kg accuracy. Weight was measured in light clothing and without shoes. Adolescents with BMI ≥ 95 th percentile with respect to age were considered as obese, between 85 th percentile and < 95 th percentile were considered as overweight and between 5 th percentile and < 85 th percentile were considered as healthy weight and < 5 th percentile were considered as underweight. Waist and hip circumference had been taken, and waist-hip ratio (WHR) was calculated. Male and female with a WHR > 0.9 and > 0.8 respectively, are considered to be at greater risk of ill-health. Height, weight, BMI, waist and hip circumference and WHR were displayed in the form of mean and standard deviation. The Student's t-test was used to find out the difference between anthropometric measurements of the normal and overweight/obese adolescents in MS Excel-2007 (Microsoft Redmond Campus, Washington, U.S). Correlation coefficient was used to ascertain the relationship between anthropometric measures and BMI of the selected adolescents. Software package SPSS version 14.0 (SPSS Inc, Chicago) was used for statistical analysis. [Table 1] depicts the overall prevalence rate of overweight/obese was found to be 6.86% among adolescent girls. The highest prevalence of overweight/obesity was observed at the age of 10-11 years (7.82) followed by 12-13 years (7.26) and 14-15 years (5.79). The prevalence of underweight, normal, overweight and obesity were found to be 28.31%, 64.82%, 5.18% and 1.68% respectively. Height, weight and BMI of the selected normal and overweight/obese adolescent girls is given in [Table 2]. Range of height varied from 135.43 cm to 151.84 cm in normal girls and 143.95-150.97 cm in overweight/obese girls between 10 years and 15 years. The weight of the selected girls was in the range of 32.48-47.28 kg in normal girls and 47.83-57.91 kg in overweight/obese girls between 10 years and 15 years of age group. BMI ranged from 17.56-20.43 kg/m 2 to 23.06-25.38 kg/m 2 in normal and overweight/obese girls respectively. However, the weight and BMI for overweight/obese girls was significantly greater than the normal girls. Waist circumference, hip circumference and WHR of the selected normal and overweight/obeseadolescent girls is shown in [Table 3]. Waist circumference of the selected overweight/obese (92.92-93.80 cm) girls was significantly (P < 0.01) higher than the selected normal girls (86.25-90.79 cm). The mean hip circumference of the overweight/obese girls were not significantly different with normal girls because the mean hip circumference in the range of overweight/obese were 96.97-98.52 cm and similar results was observed in normal girls in the range of 97.43-98.25 cm. The range of WHR of the overweight/obese girls was 0.95-0.97, and it was significantly (P < 0.01) higher than the WHR of the normal girls (0.88-0.94). The correlation coefficient was analyzed between anthropometric measurements and BMI, and it is given in [Table 4]. In this study, using BMI as a benchmark, it shows that in normal girls age, height, weight and waist circumference had high degree significant (P < 0.01) positive relation with BMI whereas waist circumference of overweight/obese girls had no significant relation with BMI. Moreover, no significant results were observed between hip circumference and BMI of the normal girls, but contradicted (P < 0.01) results were seen in the overweight/obese girls. Waist Hip Ratio of normal and overweight/obese girls was significantly related with BMI. Obesity has become known as an epidemic worldwide. WHO has declared overweight as one of the top 10 health risks in the world, while it is ranked in the top five of those in developed countries. This is quite evident, as can be deducted, [Table 1], which clearly shows that the rate of overweight/obesity was found to be 6.86% among adolescent girls in the age of 10-15 years in Salem district, India. Previous studies recommended from within India, Delhi and Chennai have shown that the prevalence of obesity was about 7% and 6% respectively. , Recent data on south Indian school children showed that the overweight percent increased from 4.3% in 2003 to 6.5% in 2005. Janssen et.al., 2004  said that the past two decades, the prevalence of overweight has more than doubled among children and adolescents. For example, the prevalence of obese school children was 20% in the UK, 15.8% in Saudi Arabia, 15.6% in Thailand, 10% in Japan and 7.8% in Iran. , The highest prevalence was noticed in the present study at the age group of 10-11 years, followed by 12-13 years and 14-15 years. Kapil et al. (2002),  Bhatia et al., (2004)  and Sood et al. (2007)  also reported that the prevalence of overweight and obesity in affluent adolescent school girls in Bangalore was found to be 13.1% and 5.0% respectively. Overweight and obesity were marginally higher in the pubertal age group, that is, 13-15 years of age, as it was observed in other studies in Delhi and Chennai,  perhaps because of increased adipose tissue and overall body weight in children during puberty. The prevalence of overweight and obesity was marginally less in the postpubertal period (16-17 years). This study found that waist and WHR were high in overweight/obese girls compared with normal girls. This finding suggests that anssen et. al., (2004)  who stated that mean waist circumference values were higher in the overweight and obese persons than in those with a normal person. BMI was mainly influenced by weight, age and height than other anthropometric measures. Misra et al. (2001)  found that there was a significant increasing trend in the prevalence of obesity with advancing age. This result is opposed with Nayak and Vinod, (2011)  who stated that a positive (r = 0. 763, P ≤ 0.0001) relationship was found between BMI and waist circumference of the children in both sexes, WC had the strongest partial (age controlled) correlations with BMI (men = 0. 56, women = 0. 80). The present findings indicated that the overall prevalence rate of overweight/obesity was found to be 6.86% and the highest prevalence was seen in 10-11 years (7.82) followed by 12-13 years (7.26) and 14-15 years (5.79) in Salem which is identical incidence reported by other studies. Mean anthropometric measures of normal and overweight/obese girls were significantly increased by age groups except hip circumference. BMI was highly influenced by weight followed by age, height, hip circumference and WHR of the overweight/obese girls. Same standard (6-10 th ) and age group (11-15 years) of girls were selected, but activity and food pattern may be differing from normal and overweight/obese girls. Recommendations for action include more physical education classes and the promotion of healthy food habits at schools and of family suppers at home. Preventive public health actions should be targeted first toward school going children and adolescents. The authors are thankful to the children and their cooperation in the study and to the headmasters, teachers of various schools for all the help extended by them. Arterburn D, Noël PH. Extracts from "Clinical Evidence". Obesity. BMJ 2001;322:1406-9. Moschonis G, Grammatikaki E, Manios Y. Perinatal predictors of overweight at infancy and preschool childhood: The GENESIS study. Int J Obes (Lond) 2008;32:39-47. Kuczmarski RJ, Flegal KM. Criteria for definition of overweight in transition: Background and recommendations for the United States. Am J Clin Nutr 2000;72:1074-81. Lazarus R, Baur L, Webb K, Blyth F. Body mass index in screening for adiposity in children and adolescents: Systematic evaluation using receiver operating characteristic curves. Am J Clin Nutr 1996;63:500-6. Kelishadi R, Pour MH, Sarraf-Zadegan N, Sadry GH, Ansari R, Alikhassy H, et al. Obesity and associated modifiable environmental factors in Iranian adolescents: Isfahan Healthy Heart Program-Heart Health Promotion from Childhood. Pediatr Int 2003;45:435-42. World Health Organization Obesity. Preventing and Managing the Global Epidemic. Report of WHO Consultation. Technical Review Series 894; Geneva: World Health Organization; 1998. Roopakala MS, Suresh A, Ashtalakshmi, Srinath, Ashok, Giridhar, et al. Anthropometric measurements as predictors of intraabdominal fat thickness. Indian J Physiol Pharmacol 2009;53:259-64. Barlow SE, Dietz WH. Obesity evaluation and treatment: Expert Committee recommendations. The maternal and child health bureau, health resources and services administration and the department of health and human services. Pediatrics 1998;102:E29. Dietz WH, Bellizzi MC. Introduction: The use of body mass index to assess obesity in children. Am J Clin Nutr 1999;70:123S-5. Cole TJ, Bellizzi MC, Flegal KM, Dietz WH. Establishing a standard definition for child overweight and obesity worldwide: International survey. BMJ 2000;320:1240-3. Musaiger O. Overweight and obesity in the Eastern Mediterranean region. East Mediterr Health J 2004;10:789. Tharkar S, Viswanathan V. Impact of socioeconomic status on prevalence of overweight and obesity among children and adolescents in Urban India. Open Obes J 2009;1:9-14. Subramanyam V, Jayashree R, Rafi M. Prevalence of overweight and obesity in affluent adolescent girls in Chennai in 1981 and 1998. Indian Pediatr 2003;40:775-9. Kapil U, Singh P, Pathak P, Dwivedi SN, Bhasin S. Prevalence of obesity amongst affluent adolescent school children in delhi. Indian Pediatr 2002;39:449-52. Stettler N, Bovet P, Shamlaye H, Zemel BS, Stallings VA, Paccaud F. Prevalence and risk factors for overweight and obesity in children from Seychelles, a country in rapid transition: The importance of early growth. Int J Obes Relat Metab Disord 2002;26:214-9. Kruger R, Kruger HS, Macintyre UE. The determinants of overweight and obesity among 10- to 15-year-old schoolchildren in the North West Province, South Africa-the THUSA BANA (Transition and Health during Urbanisation of South Africans; BANA, children) study. Public Health Nutr 2006;9:351-8. Marwaha RK, Tandon N, Singh Y, Aggarwal R, Grewal K, Mani K. A study of growth parameters and prevalence of overweight and obesity in school children from Delhi. Indian Pediatr 2006;43:943-52. Ben-Bassey UP, Oduwole AO, Ogundipe OO. Prevalence of overweight and obesity in Eti-Osa LGA, Lagos, Nigeria. Obes Rev 2007;8:475-9. Kumari DJ, Krishna BS. Prevalence and risk factors for adolescents (13-17 years): Overweight and obesity. Curr Sci 2011;100:173-7. McCarthy HD, Jarrett KV, Crawley HF. The development of waist circumference percentiles in British children aged 5.0-16.9 y. Eur J Clin Nutr 2001;55:902-7. Hsieh SD, Yoshinaga H, Muto T. Waist-to-height ratio, a simple and practical index for assessing central fat distribution and metabolic risk in Japanese men and women. Int J Obes Relat Metab Disord 2003;27:610-6. Lee IM, Rexrode KM, Cook NR, Manson JE, Buring JE. Physical activity and coronary heart disease in women: Is "no pain, no gain" passé? JAMA 2001;285:1447-54. Kaur S, Sachdev HP, Dwivedi SN, Lakshmy R, Kapil U. Prevalence of overweight and obesity amongst school children in Delhi, India. Asia Pac J Clin Nutr 2008;17:592-6. Raj M, Sundaram KR, Paul M, Deepa AS, Kumar RK. Obesity in Indian children: Time trends and relationship with hypertension. Natl Med J India 2007;20:288-93. Janssen I, Katzmarzyk PT, Ross R. Waist circumference and not body mass index explains obesity related health risk. Am J Clin Nutr 2004;79:379-84. Mo-suwan L, Junjana C, Puetpaiboon A. Increasing obesity in school children in a transitional society and the effect of the weight control program. Southeast Asian J Trop Med Public Health 1993;24:590-4.
al-Nuaim AR, Bamgboye EA, al-Herbish A. The pattern of growth and obesity in Saudi Arabian male school children. Int J Obes Relat Metab Disord 1996;20:1000-5. Bhatia V, IAP National Task Force for Childhood Prevention of Adult Diseases. IAP national task force for childhood prevention of adult diseases: Insulin resistance and Type 2 diabetes mellitus in childhood. Indian Pediatr 2004;41:443-57. Sood A, Sundararaj P, Sharma S, Kurpad AV, Muthayya S. BMI and body fat percent: Affluent adolescent girls in Bangalore City. Indian Pediatr 2007;44:587-91. 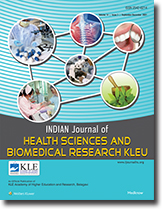 Kaur S, Kapil U, Singh P. Pattern of chronic diseases amongst adolescent obese children in developing countries. Curr Sci 2005;88:1052-6. Prashant K Chandan S. Genetic and environmental contribution to childhood obesity and its comorbities in the Hispanic population. Am J Clin Nutr 2009;84:646-54. Sharma A, Sharma K, Mathur KP. Growth pattern and prevalence of obesity in affluent schoolchildren of Delhi. Public Health Nutr 2007;10:485-91. Spiegel K, Tasali E, Penev P, Van Cauter E. Brief communication: Sleep curtailment in healthy young men is associated with decreased leptin levels, elevated ghrelin levels, and increased hunger and appetite. Ann Intern Med 2004;141:846-50. Sakamaki R, Toyama K, Amamoto R, Liu CJ, Shinfuku N. Nutritional knowledge food habits and health attitude of Chinese university students - A cross sectional study. Nutr J 2005;4:4, 1-5. Ogden CL, Flegal KM, Carroll MD, Johnson CL. Prevalence and trends in overweight among US children and adolescents, 1999-2000. JAMA 2002;288:1728-32. Misra A, Pandey RM, Devi JR, Sharma R, Vikram NK, Khanna N. High prevalence of diabetes, obesity and dyslipidaemia in urban slum population in northern India. Int J Obes Relat Metab Disord 2001;25:1722-9.